Hawk has gathered his party! I read (and until recently subscribed to) “Knights of the Dinner Table” gaming magazine. It was there that I first heard of this film. I’d never seen it before or heard of it. Yet when I asked my friends they almost universally said they’d seen it, most claimed multiple viewings, all agreed it was a fun movie, and couldn’t believe I had somehow not seen it. So, much like my experience with Deathstalker II, I have now seen this film and offer my thoughts. Hawk (John Terry) is the youngest son of a nobleman. 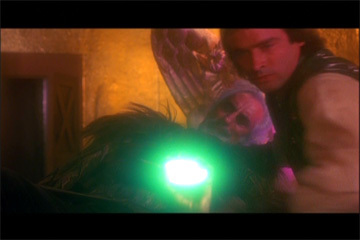 As the movie opens we see Hawk’s father slain by the evil Voltan (Jack Palance). 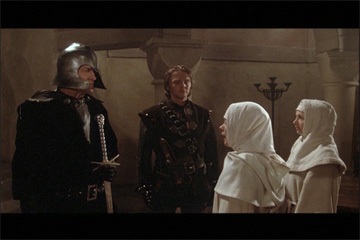 The death of his father makes Hawk the heir to a powerful magic sword, and Hawk uses this birthright to help citizens of the realm and to hunt down Voltan. The struggle between these two builds up to an epic battle that will require Hawk to form a party of heroes to combat Voltan’s army of evil fighters. The movie hinges on one of the most beloved RPG tools – a party of heroes. Hawk’s adventures clearly extend beyond those that require a party, but the interplay between these heroic characters is similar to a fantasy version of the group in The Magnificent Seven. You can easily imagine role-playing the kind of adventure put together here. 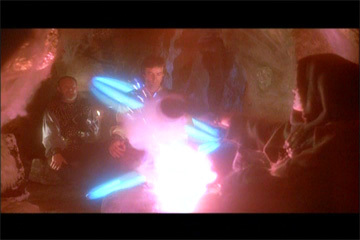 The special effects are dated, and sometimes feel like vintage Dr. Who – but I like that sort of thing. This film is earnest. It takes itself seriously, and still has fun. And the soundtrack – which sounds eerily like Jeff Wayne’s War of the Worlds Musical – is catchy and fun to listen to throughout the film. Hawk the Slayer could get the MST3K treatment. Yet when I watched it I was so blown away by the aforementioned earnestness that I didn’t spend a lot of time mocking the film. And that’s the point, I guess. I’m not sure this film deserves to be mocked. Hawk the Slayer get’s a 6. There’s funny stuff to be said, but the film holds its own. HTS has a lot of action! The writer of this film has clearly read (or been influenced by) Tolkien, and the elf Crow could give Legolas a run for his money. The cross-bow that the one-handed man uses is wicked-sweet. The giant and dwarf are underutilized in the fights after they join Hawk, but their banter and interactions are priceless. The cast here is superb. One of my favorite villainous actors, Jack Pallance gets to have one of my favorite lesser known British actors play his son. The role of Drogo, Voltan’s son, is performed by Shane Briant. Shane was Dr. Frankenstein’s assistant in the Hammer film “Frankenstein and the Monster from Hell” – which in turn starred David Prowse – who you may have seen in a little film called “Star Wars.” Briant also starred in “Captain Kronos – Vampire Hunter” – an underrated film which deserves a MFGWLM review of its own. Voltan and Drogo are obviously not afraid of these nuns. This movie influenced a lot of gamers. Not me, mind you – but it is certainly one I intend to show my kids when they get older. 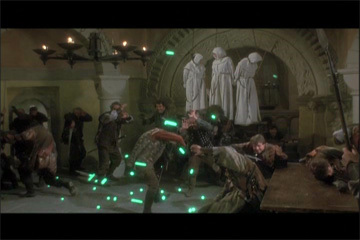 The summoning of the party members is an interesting part of the film because each of the summoned heroes are introduced in their own vignette. Also, it is spoofed in the last episode of the original Blackadder series when Blackadder seeks out the most evil men in the world. The gathering of the party - later spoofed in the original Blackadder TV show. 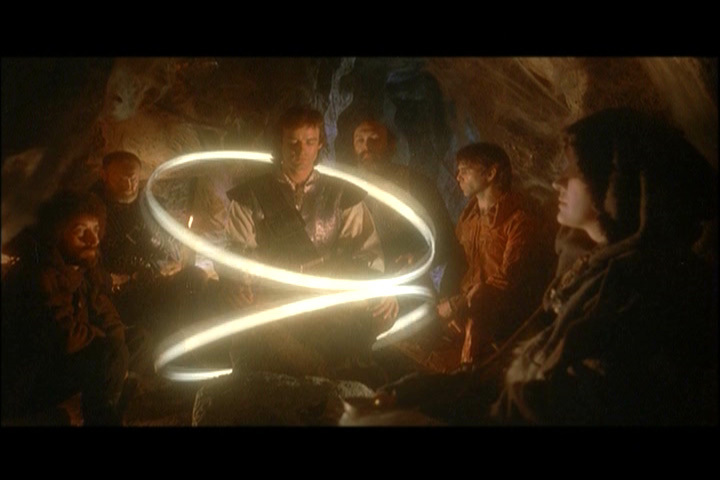 The magic spells in the film are mostly performed by two characters. One is a shadowy wizard who lives in a cave, the other is a shadowy witch who lives in a… well, a cave. Maybe all magic people live in caves? It doesn’t matter. When the final battle takes place, the witch casts a spell that behaves an awful lot like Prismatic Spray. That’s got to be more than coincidence, doesn’t it? Regardless it shows how effective such a spell can be at causing disruption. The witch casts a spell that behaves an awful lot like Prismatic Spray. This is a movie that will entertain and delight your gamer friends. A great stocking-stuffer, and a must-have for any S&S collection. Just wondered if you had an email address for a Hawk Press Release? I apologize for the delay in responding. Looking forward to the sequel. Thanks for chiming in.